8.2 What do we measure? Biomaterials and medical devices must be rigorously tested in the laboratory before they can be implanted. Testing requires the right analytical techniques. Characterization of biomaterials reviews the latest methods for analyzing the structure, properties and behaviour of biomaterials. Beginning with an introduction to microscopy techniques for analyzing the phase nature and morphology of biomaterials, Characterization of biomaterials goes on to discuss scattering techniques for structural analysis, quantitative assays for measuring cell adhesion, motility and differentiation, and the evaluation of cell infiltration and tissue formation using bioreactors. Further topics considered include studying molecular-scale protein-surface interactions in biomaterials, analysis of the cellular genome and abnormalities, and the use of microarrays to measure cellular changes induced by biomaterials. Finally, the book concludes by outlining standards and methods for assessing the safety and biocompatibility of biomaterials. 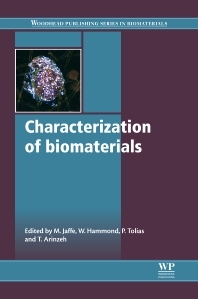 With its distinguished editors and international team of expert contributors, Characterization of biomaterials is an authoritative reference tool for all those involved in the development, production and application of biomaterials. "A brief, yet very well-written and useful overview, suitable for specialists as well as researchers new to the field." --Dr. Aleksandr Ovsianikov, The Biomaterials Network. Willis B. Hammond is a Research Professor in the Department of Biomedical Engineering at NJIT. Peter Tolias is Director of the Bio-innovation Program and a Research Professor in the Schaefer School of Engineering and Science at the Stevens Institute of Technology, USA. Treena Arinzeh is Professor of Biomedical Engineering at NJIT.